The microneutralization assay is another technique used by the Centers for Disease Control and Prevention to determine that some adults have serum cross-reactive antibodies to the new influenza H1N1 virus. Let’s explore how this assay works. 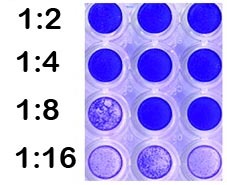 The upper left panel shows uninfected cells, and the other panels show the cells at the indicated times after infection. 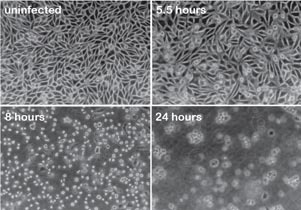 As the virus replicates, infected cells round up and detach from the cell culture plate. These visible changes are called cytopathic effects. We can use this visual assay to determine whether a serum sample contains antibodies that block virus infection. A serum sample is mixed with virus before infecting the cells. If the serum contains antibodies that block viral infection, then the cells will survive, as determined by staining with crystal violet. If no antiviral antibodies are present in the serum, the cells will die. In its present form, this assay tells us only whether or not there are antiviral antibodies in a serum sample. To make the assay quantitative, two-fold dilutions of the serum are prepared, and each is mixed with virus and used to infect cells. At the lower dilutions, antibodies will block infection, but at higher dilutions, there will be too few antibodies to have an effect. The simple process of dilution provides a way to compare the virus-neutralizing abilities of different sera. The neutralization titer is expressed as the reciprocal of the highest dilution at which virus infection is blocked. This explanation should clarify how the neutralization titers were obtained that are reported in the CDC study cited below. By the way, microneutralization simply means that the neutralization assay is done in a small format, such as a 96 well plate, instead of larger cell culture dishes. The authors of the CDC study note that “although serum hemagglutination inhibition (HI) antibody titers of 40 are associated with at least a 50% reduction in risk for influenza infection or disease in populations, no such correlate of protection exists for microneutralization antibody titers”. They used mathematical analysis to determine the relationship between HI and microneutralization titers. They found that in sera from children, an HI titer of 40 corresponded to a microneutralization titer of 40. However, in adults, an HI titer of 40 corresponded to a microneutralization titer of 160 or more. I don’t know the reason for this difference, but one possibility is that not all neutralizing antibodies in adult sera are able to inhibit hemagglutination. Understanding why this situation might occur will require a discussion of how antibodies block viral infection. I was so suprised when my lecturer explained to us that labs still use these HeLa cells even though they aren't even human anymore. I've been wondering since, why don't they get a 'fresh' batch of transformed cells from a more recent donor? Surely cells with the correct chromosome number is the more sensible choice? That was so clearly and simply explained. Thanks so much! I was just trying to learn it from listening to a recorded lecture and looking at black and white badly xeroxed pictures. It seems to me these assays confound the neutralization abilities of particular IgG antibodies and their concentration in serum. There's also the question of how effective antibody concentrations map to the kinetics of infection. Do standing (“equilibrium”) concentrations correlate linearly with response upon challenge? The MN protocol used in CDC is a traditional neutrlization test combined with ELISA method. However, the ELISA procedure is highly dependent on antibody quality. I don’t know how to get the first antibody (anti-NP antibody) if I want to set up this platform in our Lab. Only CDC has this standard NP antibody. So… Can I just use the traditional NT based on crystal violet staining? I have a question regarding cross neutralisation. Two virus strains were used, say A and B, and serum raised from each virus were tested against the homologous strain and the heterologous strain. The ND50 titre was calculated by Karber formula. The homologous titres were normalised to 100 and the heterologous titre was calculated accordingly. The titre of serum A against virus B after normalisation is 40 and Serum B against virus A is 120. Now my question is, after normalisation to 100, at what percentage should I call the strain as cross neutralising. Please provide reference.